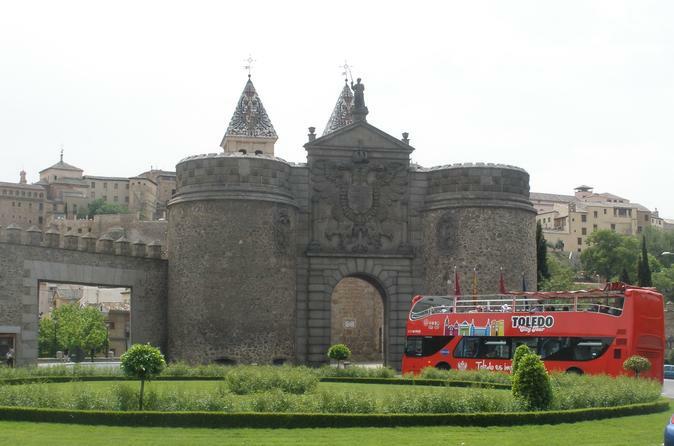 Enjoy your trip to Toledo on a confortable motor coach, once you arrive, visit this city-museum at your own way. Take the time you needed to visit what you're really interested in. Also this tour includes 1 hour of a historic city center walking tour. If you need more, add the touristic wristband to make your tour perfect! Located 70 km away from Madrid is Toledo, a beautiful city-museum declared World Heritage Site by UNESCO. It is one of the oldest towns in Europe and has a great artistic beauty and buildings from almost all periods in history (Arabian, Gothic, Mudéjar, Renaissance and Baroque style). Toledo is called the “City of the Three Cultures”, since Christians, Muslims and Jews lived together. In the XVI century, it was also the place of residence of the great painter El Greco. A historic city center walking tour of Toledo is included. During 1 hour, you will visit Zocodover, outside of Cathedral and Jewish quarter. When you arrive to Toledo, the guide pick up you on the bus and start the tour from Zocodover square. The walking tour is in English and Spanish. When the tour finish, you will arrange your day in Toledo as you like. Return to Madrid from Toledo at 6:15 pm, the meeting point in Toledo for returning will be in front of the Restaurant Hacienda del Cardenal (Paseo de Recaredo 24), close to Puerta de Bisagra. The tourist wristband gives you access to 7 of the most important monuments in the city: Synagogue of Santa María la Blanca, Church of los Jesuitas, The Church of Santo Tomé-Burial of the Count of Orgaz, Monastery of San Juan de los Reyes, Mosque of Cristo de la Luz, the Church of El Salvador and the Real Colegio de Doncellas Nobles.. The wristband is for individual use and non-transferable. No expiry date, valid until it breaks. Do not change the wristband in any way. Removal invalidates the wristband.